Many of the items included in my collection of vintage safari baby nursery decor were secondhand store finds. Interspersed in the mix is a generous sprinkle of decorations that I found at mainstream baby boutiques and stores. As webmaster of a blog that focuses on decorating and enjoying antiques, the news that I would be having a boy in the spring presented an excellent opportunity to practice basically what I preach on a regular basis. The room that I had in mind had a feeling of fun, nothing old and stuffy. Here is a detailed account of the steps that I took to accomplish my decorating goals.
. For the walls, I chose a blue paint color by Ben Moore that has a hint of grey but isn't too dismal. The Safari Baby Nursery bedding set came from PB KIds. It came with a set of four crib sheets with my favorite covered in pictures of safari animals. We purchased a Simmons baby crib which came very highly rated and is extremely safe and sturdy. 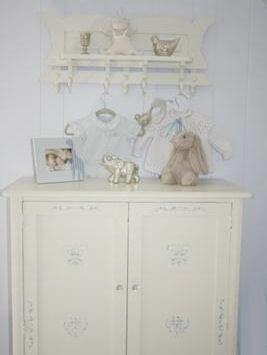 I chose to paint an antique dresser that I had from when I was a child to use as a changing table. I repainted it in a creamy white and then purchased some new mercury glass drawer pulls from Anthropologie. We purchased the nursery rocker, made by Wendy Bellisimo, at Babies R Us. I decorated it with a really cute elephant accent pillow that I found at Pottery Barn that fit perfectly with my plans for a vintage Safari Baby Nursery theme and then I draped my moms vintage chenille baby blanket over the back to add a little color. I purchased my blue, antique side table at a consignment shop for a mere $40.00. I also found a vintage alabaster lamp at the antique co-op that I belong to for $50.00. 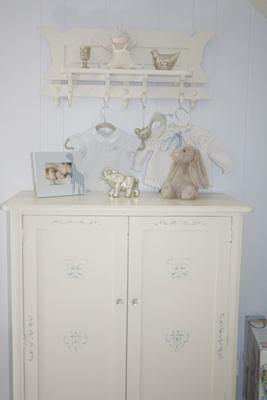 For additional nursery storage, I used an antique armoire that once was used in my great grandparents paint shop in Brooklyn NY. The piece had previously been used in my dining room. I had stenciled it a few years ago and it just happened to match the style of the space perfectly. Perched above the armoire I found a vintage shelf at another favorite consignment shop of mine for $15.00. I mixed some new and old mercury glass pieces on top of the shelf that were a close match to the drawer pulls that I bought for the changing table. Then I decorated the front of the nursery armoire with my son's going home outfit and a handmade knitted baby sweater to warm it up a bit. Adding to the vintage safari nursery decor I found another vintage mercury glass elephant for a mere $3.00 at another antique shop and paired it with a cute bunny that I spotted at Baby Gap. Since the baby's safari themed room is rather large, we kept the guest bed which is made with a mattelasse bedspread that I found a few years ago on a trip to Paris, France. The baby blue color accented the cream walls perfectly. Next to the bed I found an old, wooden bookcase from my antique co-op. It was originally painted black so I re-painted it to coordinate with the rest of my eclectic blend of new and vintage finds. I found three baskets for storage from The Christmas Tree Shop and accented the top with a vintage Humpty Dumpty lamp that was also mine as a kid. I bought the birds nest print that I hung above the arrangement from Home Goods for $20.00. Then I added some more alabaster birds to complete the animal theme. Rather than buy matching PB Kids curtains to use in my baby boy's Safari baby nursery, I found a coordinating fabric and had them custom made. Once the curtains were hung, I used antique mercury glass tie backs from the 1800's to open the nursery windows to the view. I love the vintage yet fresh, new feel of the room and hope to pass on some of these family heirlooms to my son when he has a family of his own! I love the colors and designs that you used to give the old dresser a makeover and plan to do something similar with a piece of furniture that was once in my great-grandmother's bedroom. I have a question about how you decorated the piece in your photo. Are the designs painted on the dresser or did you use decals? If you hand-painted the flowers could you please provide a close-up picture so that I might draw a pattern to use?